The Time Bum has developed a growing affinity for Russian Watches. Like all watch nerds, it started with the Vostok Amphibia. For my next purchase, I wanted something different, not only different than the Vostok, but also unlike any other watch I owned. 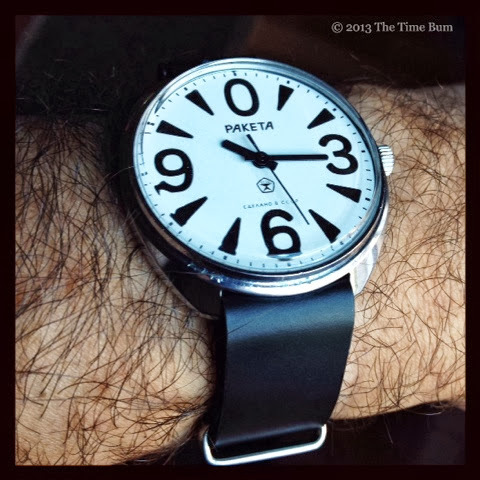 A Soviet vintage Raketa "Big Zero" was the logical choice. 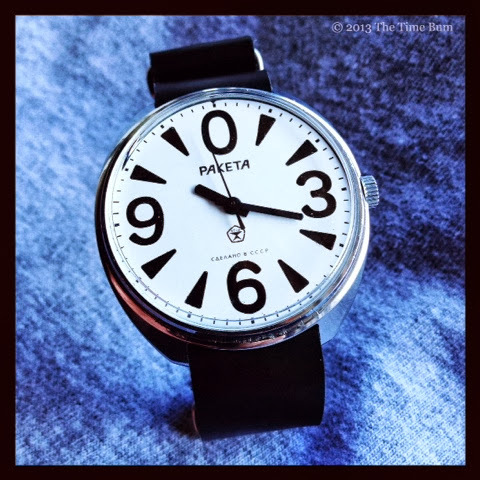 Raketa, or "rocket" is a line of watches produced by the venerable Petrodvorets Watch Factory, which was founded in 1721, and in its modern incarnation, is still cranking out watches. It is possible to buy a new Petrodvorets Classic (as it is properly called) in a number of interesting dial variants, but I decided to kick it old school and find one "сделанный в cccp" (made in USSR). For that, I turned to the global marketplace for all things esoteric: eBay. After perusing a number of watches, I happened upon eBay seller samun_povt in St. Petersburg in the Russian Federation. Unlike most others, Raketas are clearly his passion. 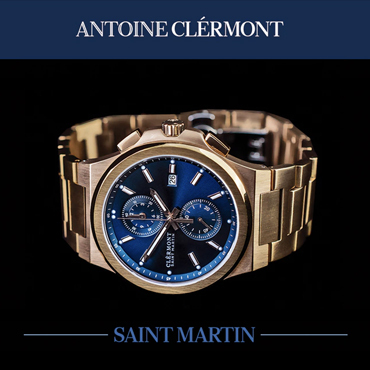 He collects and services these watches, and has assembled a large and varied collection. 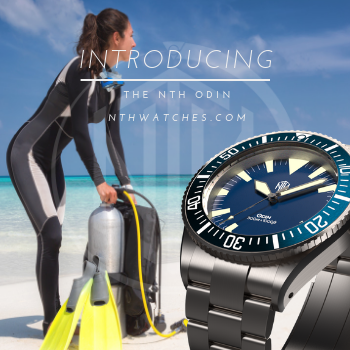 His listings include numerous high quality photographs from every angle and a video of the watch in action. Every detail and blemish is clearly displayed. He also provides a 3 month warranty of function and accuracy. Buoyed by his thoroughness and 100% feedback rating, I took the plunge and bid. His Zeros generally start at $55. I won this one for $70, plus $15 shipping. My watch arrived in the states in about ten days, which was surprisingly quick. Sadly, it would only run intermittently. After some email correspondence, we determined it was likely the result of a balance wheel damaged by a hard shock in shipping. I sent the watch back to its motherland for repair, and waited. And waited. And waited. Turns out, the trip home was not quite as swift. Four months later, it finally arrived in St. Petersburg, and was promptly repaired with another video to prove it. A couple weeks later and it was back in my hands and running properly. I commend samun_povt for his exemplary service and only wish our postal services had followed suit. The Big Zero has gained its nickname in the most obvious way. It has four wildly oversized Arabic numerals on a white dial separated by massive "teeth" with a 0 in the 12:00 position. The dial takes up almost the entirety of the 39mm case, making the small watch appear much larger on the wrist, an impression aided by the tall acrylic crystal and relatively small 18mm lug width. The layout is the opposite of most watch faces as the huge black markers dwarf the undersized stick hands. 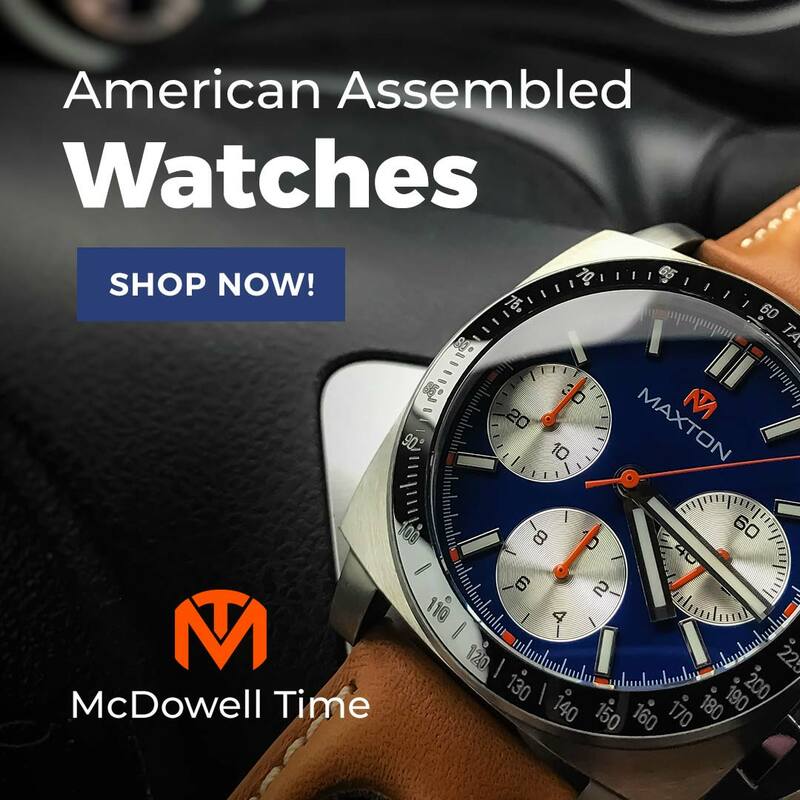 It is a bold design and to my eye, reminiscent of pre-war posters and signage, even though the watch only dates back to the 1980s. This particular watch features a pentagon logo that indicates it was made for export. The markers have been retouched with a bit of black paint, but it was a tidy job. Modern Petrodvorets Classics have polished stainless steel cases, but Soviet era cases are chrome plated steel or base metal. Inside this case beats a 16 jewel Raketa 2609.HA, a simple and sturdy hand wound movement that has been in service since the early 1960s. It is not water resistant, and there is no illumination. 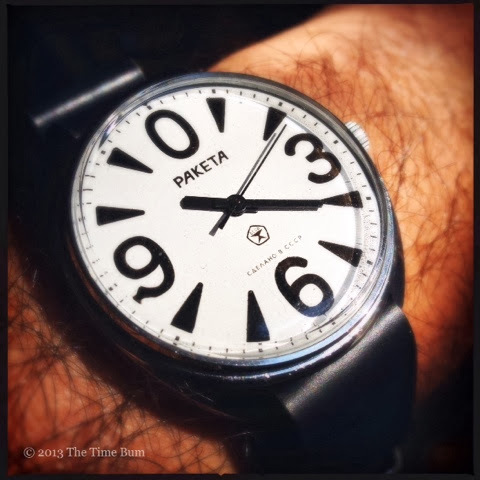 The Raketa came on a remarkably flimsy strap, but this was easily remedied. 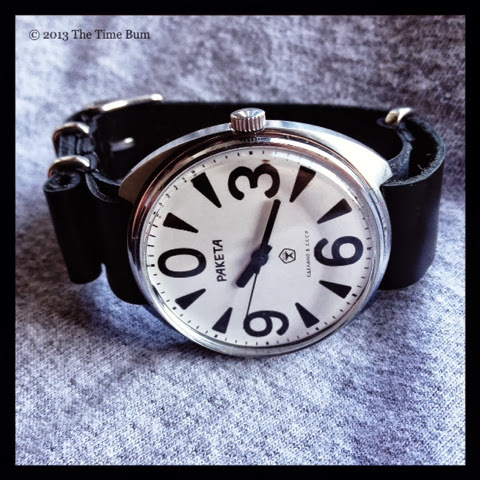 A black leather NATO from Crown & Buckle proved to be the ideal accompaniment. 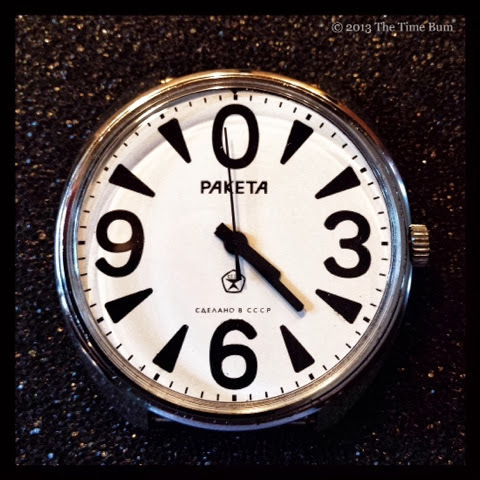 According to Raketa, Soviet Premier Mikhail Gorbachev wore one, and on one occasion, when asked by Italian journalists what "perestroika" meant for Russia, he said that Russians wanted to start their lives from zero, and showed them the watch to illustrate his point. Personally, I find the story suspect - not because of what was said, but because I have never seen a picture of Gorbachev wearing anything other than suit, and surely he had more fashion sense than to wear a Big Zero with business attire. This watch is an odd duck. With its in your face dial, it is not a dress watch. 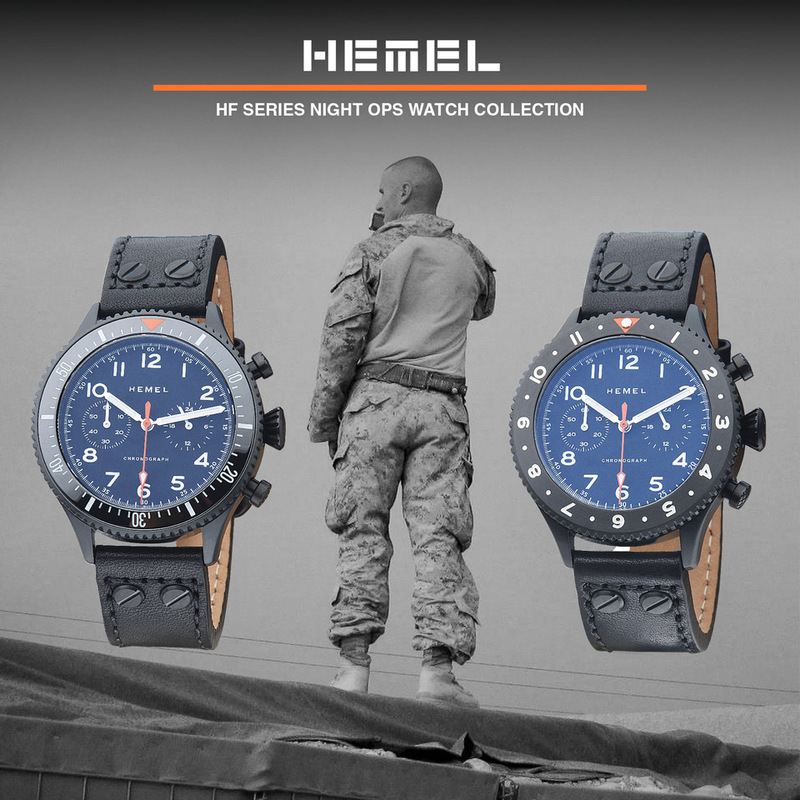 With its lack of lume and water resistance, it is not a tool watch. It is really more of a casual weekend lets-get-coffee watch, more appropriate with jeans and a black t-shirt than a coat and tie. Regardless of how you choose to wear it, this classic Raketa is charming, striking, and a worthy addition to your collection. Pro: Bold design, nice price. Sum: An eye catching piece with an interesting history. The Time Bum approves.